Ornate fountain can be displayed anywhere. 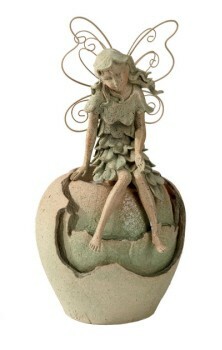 The fairy is sitting on a broken urn. The water pumps up underneath her and flows behind her legs. Made of polystone. Finished in beige color; comes in 2 pieces. Comes with pump that plugs in. Just add water, attach the fairy to the top of the urn. Dimensions- 15.5 in. T x 9 in. W.